I previously mentioned privy furniture with interestingly shaped aprons. 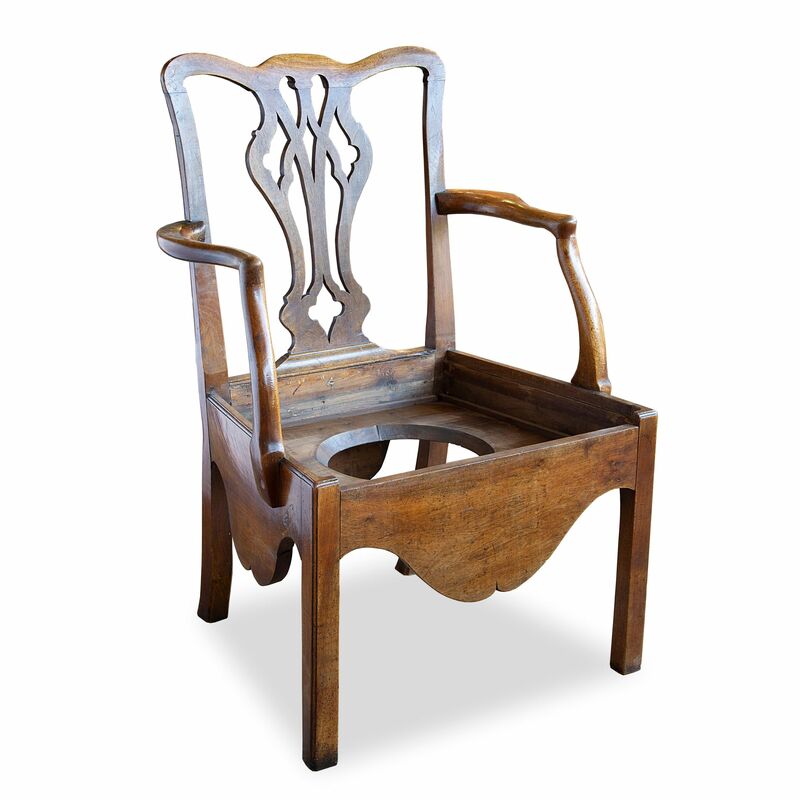 This oak Chippendale-style commode chair incorporates the familiar aprons along with a removable rush seat with which to access a ceramic potty. Fig. 1. 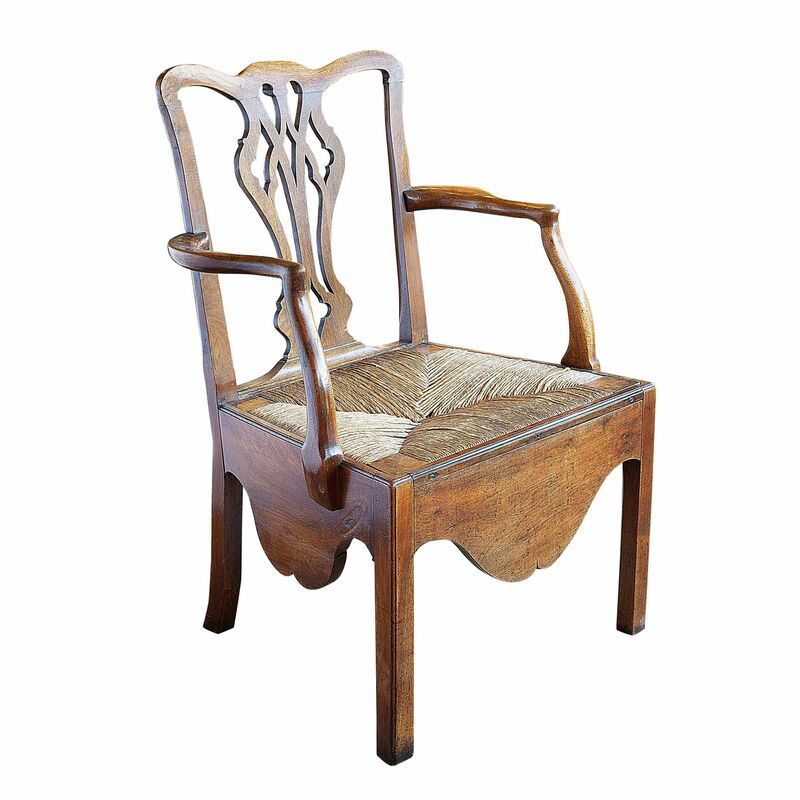 George III oak commode chair, circa 1770. Fig. 2. Removing the seat reveals the potty (absent). This entry was posted in Antiques and tagged commode, potty. Bookmark the permalink. Do you know where these commode chairs were kept/used? Were they sitting room furniture ? Were pot-cupboards/nightstands the bedroom equivalent? Commode chairs were placed in bedrooms and closets (small, personal rooms where one might read a book or letters in private, or hold a confidential conversation). Elegant looking but looks like a real “Groover” (a term from river rafting wherein one gains marks from making a similar “deposit”in an ammo can). Would there have been another insert? Yes, there would have been a polished oak (in this instance) board with a sympathetically moulded aperture above the potty. The board would have been level with the top of the front apron. How do we place this as GIII rather than GII? Is it the more neoclassical (cf rococo) splat? Or is there some other giveaway? Disregarding the seat and aprons, the chair, with its moulded front legs and seat rails, splayed rear stiles, crest rail and splat, conforms with many others of the same period.